The country’s original name, Sukothai, means “Dawn of Happiness,” and that is what the Church has brought for a small but growing group of members. On Tuesday and Thursday nights, twenty to thirty Thai young adults gather at the Asoke chapel in Bangkok for institute choir rehearsal. Their choir director and institute teacher, Suchat Chaichana, passes out copies of the recently translated Church hymnal and choral music that he has translated for Thai singers. Providing a boost to the choir was Sister Joan Ford, formerly a member of the Asoke (English-speaking) Branch with a degree in music, who volunteered to help Brother Suchat (Thais use their first names almost exclusively). She began by warming up the voices of choir members with a short voice lesson. Since their language is tonal, the singers struggled to stay on pitch as they learned to control the rising and falling tones of Thai. Then they practiced singing harmony, a new concept for Thais who traditionally sing only the melody. Mostly returned missionaries, these young singers are a close group, and several temple marriages have taken place between couples who sing in the choir. The choir’s unity and spirit provide a strong example of gospel success in Thailand. Over the last five years, the choir has sung at a university near the church, performed Christmas programs at shopping malls, and provided music for missionary open houses and district conferences. One of the highlights of the choir’s activities was a musical program in 1992 commemorating the martyrdom of the Prophet Joseph Smith and his brother Hyrum. Speaking parts in the program were given by four choir members who dressed up as Joseph Smith Jr. and his wife, Emma, and Joseph Smith Sr. and his wife, Lucy. A gospel foundation is present in this land wrapped in timeless beauty and ancient history. 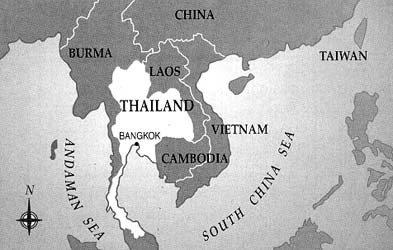 Thailand, located directly south of China, shares its borders with Burma, Laos, Cambodia, and Malaysia. This tropical land, where it rains daily for three months and then not at all for nine months, is laced with rivers, rain forests, and wooded mountains. Bangkok, as the capital and largest city in Thailand, is home to more than ten million people. Its streets are crowded with native Thais, a variety of Asian peoples, and Europeans. Thais wear everything from the traditional panung, a colorful piece of cloth wrapped tightly around the body, to jeans and T-shirts. The noise of traffic and tonal languages is endless. Vendors sell spicy foods on every street, and near mealtime, as they toss garlic into hot oil, savory aromas fill the air. Ultramodern high-rise office buildings stand in contrast to old ornate architecture, much of which has been painted with bright colors and trimmed with gold. People in Bangkok live in houses, apartments, and even in boats along the canals. Most of the sixty million people of Thailand prefer to live in villages where they can grow rice on their own land. Those who reside along the country’s many rivers and canals live in houses of wood or thatch built high on stilts, where farm animals take shelter underneath. Bright green rice fields, their waters glistening in the afternoon sun, stretch outward from the villages in orderly squares that add to Thailand’s beauty. The gospel has found its place here. One stake, four districts, eleven chapels, five wards, and twenty-one branches house the more than six thousand Latter-day Saints. Members can read the Bible (translated by the Thai Bible Society in 1971), Book of Mormon, Doctrine and Covenants, and Pearl of Great Price in Thai. Nearly 20 percent of the one hundred missionaries who serve in Thailand are native Thais. Brother Wairot Wanitwongsaa and Brother Jackrit “Jack” Trikrutpan are examples of active Latter-day Saints who were drawn years ago to a Latter-day Saint chapel or to the missionaries teaching on the streets of Bangkok. Both were baptized, served missions in their native land, and are active members in Bangkok. Nine-year-old Rujeerawan “Tu” Trawanhongphonrat joined other Thais in 1970 in an English class in Korat taught by the missionaries. “I could feel of their goodness and spirit,” says Sister Tu. “I wanted to pray and ask if the gospel was true and if Heavenly Father lived. The missionaries helped me. When I prayed, I felt peaceful inside, and my heart felt warm and growing.” Baptized shortly thereafter, Sister Tu has since served a mission and enjoyed watching those to whom she taught the gospel also serve missions. These experiences are far different from those in 1853 of Elder Elam Luddington, the first missionary to Thailand (then called Siam). Only Elder Luddington went on to Siam, his companion being too ill to continue. He arrived on 6 April 1854, nearly a year after he left America. Three days after the ship landed, Elder Luddington baptized James Trail, the ship’s captain, and Trail’s wife. They would be his only baptisms during the four months and five days he lived in Bangkok. Stoned twice and poisoned once, Elder Luddington remained persistent and faithful. He worked among the Europeans because he could not speak the language of the country. Shortly thereafter, Elder Luddington was called home. On his return ocean voyage, he experienced a typhoon, a mutiny, a ship’s fire, and a famine. Having survived these and many other dangers during his mission of more than two years, he finally reached San Francisco safely on 27 June 1855. Though his mission was among the most distant and challenging of the early Church, he obediently fulfilled it with courage and faith. It would be nearly a century after Elder Luddington’s mission before The Church of Jesus Christ of Latter-day Saints would again have a presence in Thailand. During the 1950s and early 1960s, Latter-day Saint families in Bangkok were authorized to hold services. As the Vietnam War intensified and Latter-day Saint servicemen longed to worship together, groups were started at some bases of the United States Air Force, such as those at Udorn, Ubon, Thakli, and Korat. The turmoil of the Vietnam War, then near its height, slowed the process of the Church becoming officially recognized in Thailand. Though Thailand itself has been free of war for hundreds of years, border skirmishes, the wars of neighboring countries, and the steady influx of refugees have continued to complicate the political process. Finally the Church was given permission to enter Thailand, and on 2 February 1968, six elders were transferred from Taiwan and Hong Kong to Bangkok. Within a few days, the elders had enrolled at the American University Alumni School and had begun to learn the complex Thai language. Within a week, they had employed a translator to translate the missionary discussions into Thai. On 6 March 1968, the six elders began full-time proselyting among the Thai people, and the first meeting in Thai took place on March 17 of that year. The first challenge the missionaries faced was helping Thais learn about Jesus Christ. Established by centuries of tradition, Buddhism is the state religion of Thailand, and 95 percent of the Thai people are Buddhist. Thus, the decision to follow Jesus Christ brings with it the risk of rejection by friends and family and can bring disgrace upon a family. However, Thai Latter-day Saints have met this challenge with confidence. Puttiporn Triyasakorn was baptized in 1987. “For Thai people, the Christian religion is very new because we are used to Buddhism,” she says. “It was easier for me because my mother is the one who found the gospel. One day on the bus, she heard the missionaries talking about the law of chastity and the Word of Wisdom. Because she wanted my brothers and me to stay away from alcohol and tobacco, she wanted all of us to listen to the missionaries.” Sister Puttiporn read the Book of Mormon, and through prayer and several dreams she gained a testimony. She and her mother and three brothers were all baptized. Her childhood sweetheart, whom she introduced to the gospel, was also baptized, and they were sealed in the temple in 1989. Srilaksanaa “Sri” Suntarahut started to help translate the Book of Mormon in 1970 as lead translator of the first Book of Mormon translating committee in Thailand. Sri, who had outstanding language skills because of her years of living in the queen’s palace (see “Raised by a Queen,” p. 55), saw the project completed in 1974. Others helped her prepare the translation for publication, and it was published in 1976. In 1975, while waiting for approval of the Book of Mormon translation, she began translating the Doctrine and Covenants. The other members of the translating committee discontinued their work on the project for various reasons, so Sri was the mainstay of the scripture translations. Though she went to her job during the day, she felt driven to translate when she returned home. Often she worked into the night, completing a rough translation of as many verses as she could do to her satisfaction in order to have them ready for the daily meeting of the translation committee. Once she went with other members to help with a cleaning project. After several hours of hard work, others suggested she go home to rest. She said that she was already resting because if she went home she would feel compelled to translate and could not sleep. The translation was completed in 1979. Among the many things that have strengthened the gospel in Thailand is the establishment of seminary and institute classes. Thailand’s Church Educational System (CES) country director, Suchat Chaichana, has been interested in teaching the gospel since his baptism on 6 March 1976. As a missionary from 1978 to 1980, Brother Suchat was assigned to translate the seminary manuals into Thai. It was the first time he had heard of seminary. In 1982 he was asked to help start the CES program in Thailand and became a part-time instructor. He traveled throughout Thailand teaching seminary until he could train volunteer seminary teachers in the villages outside of Bangkok. Elder Pramual baptized fifteen people during the first eighteen months of his mission. With only three months left, he was sent to Kumpawapi, and within one month he had baptized all seven members of his family. Twenty days before he was to finish his mission, he met a Christian minister and converted him. The congregation followed. Elder Pramual baptized fifty people before he finished his mission. In June 1990, under the leadership of then mission president Anan Eldredge, more than two hundred members went by plane to the Manila Philippines Temple. Many others also made sacrifices. One man sold his only water buffalo to go to the temple. Later, when members of Bangkok’s Asoke Branch and a few members in Salt Lake City heard of this, they began donating money to buy him another water buffalo. Soon there was enough money to buy a water buffalo and its calf. This focus on the temple resulted in an unprecedented infusion of strength and dedication into the lives of Church members in Thailand. Since then, leaders have organized regular trips to Manila. In June 1995, Elder Neal A. Maxwell of the Quorum of the Twelve Apostles and Elder Kwok Yuen Tai of the Seventy organized the Bangkok Thailand Stake﻿—the first stake in Thailand. Sukothai, first Thai kingdom, established. First missionary, Elder Elam Luddington, arrives in Bangkok. Thailand District organized to meet the needs of American servicemen. Elder Gordon B. Hinckley of the Quorum of the Twelve dedicates Thailand. President Keith E. Garner of the Southern Far East Mission leads the first six missionaries (shown above) to serve in Thailand. Top row: Craig G. Christensen, Larry R. White, Peter W. Basker; bottom row: Alan H. Hess, Robert W. Winegar, L. Carl Hansen. Elder Ezra Taft Benson of the Quorum of the Twelve visits the king of Thailand. Thailand becomes part of the Southeast Asian Mission. First chapel dedicated in Bangkok. Thailand has 300 members and 50 full-time missionaries serving in nine branches. Book of Mormon published in the Thai language. The government rules that missionaries have to leave the country every ninety days to extend their visas. Anan Eldredge becomes the first Thai mission president of the Thailand Bangkok Mission. First Thai excursion to the Manila Philippines Temple. Larry R. White, one of the original six missionaries to Thailand, becomes president of the Thailand Bangkok Mission. Elders Neal A. Maxwell and Russell M. Nelson of the Quorum of the Twelve bestow apostolic blessings on the country. The requirement that missionaries leave Thailand every ninety days to renew their visas is rescinded. Troy L. Corriveau, who was the tenth missionary called to Thailand and a member of the first Book of Mormon translating committee, becomes new president of Thailand Bangkok Mission. Bangkok Thailand Stake organized—the first stake in Thailand. Srilaksanaa “Sri” Suntarahut was born in Bangkok, Thailand, on 4 July 1924. Her father was doctor for the royal princes. Her mother was a friend of H. M. Queen Intharasaksaji. Sri’s family often visited the queen at the royal teak palace. When Sri was six years old, the queen asked to raise her. This arrangement was made on the condition that Sri could freely visit her family. Until she was seventeen, Sri lived with the queen. Then she went to Chulalongkorn University. After World War II, she became the financial secretary for a group of high-level government officials because of her excellent language skills. By 1968, when Elders Larry White and Carl Hansen met Sri, she was married and had a family. “I did not like the missionaries very much at first,” says Sister Sri, “but they kept coming back. I put the Book of Mormon on the shelf for three months. One night I decided to look at it, so I held it up and prayed, ‘If there is something good in here for me, let me know it.’ I opened it and read until I couldn’t read anymore. Tears came to my eyes. Then I held the book to my chest. Soon I went upstairs to my room and closed the door. It was the first time that I knelt down and prayed. I cried and called out, ‘My Father, my Father.’ I knew he could hear me. I prayed and cried for a long time. When I got up, I began to read again without stopping.” Sri and two of her children were baptized on 4 July 1968, her forty-fourth birthday. Quoted in “Beginnings in Thailand,” in Spencer J. Palmer, The Church Encounters Asia (Salt Lake City: Deseret Book Co., 1970), pp. 127–38. Quoted in David Mitchell, “The Saints of Thailand,” Tambuli, International Magazines of The Church of Jesus Christ of Latter-day Saints, May 1993, pp. 42–43. Joan Porter Ford, a choir director and youth Sunday School teacher in the Castlewood Canyon Ward, Willow Creek Colorado Stake, lived with her husband in Bangkok for three and a half years while he was assigned to the U.S. Embassy there.